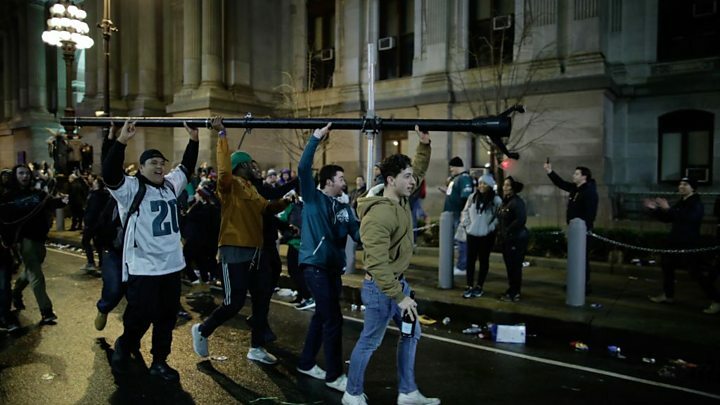 Incidents of rioting and looting have taken place in the US city of Philadelphia as fans celebrated a historic Super Bowl win on Sunday. Social media pictures showed scenes of chaos as tens of thousands of Philadelphia Eagles' fans rejoiced. A police officer is among those reported injured. Cars and shopfronts have been damaged and looted. But despite the unruly crowds after the game, police officials say the celebrations were mostly peaceful. Only three people were arrested, according to Ajeenah Amir, a spokesman for Mayor Jim Kenney. "Tens of thousands came out and celebrated this amazing victory, and but for a handful of bad actors the celebration was peaceful and jubilant," Ms Amir said in a statement to BBC News, adding that the city is thankful to law enforcement. The city has announced that a celebration parade will be held on Thursday. Almost 10,000 tuned into a public police radio, with #phillypolicescanner trending nationally on Twitter. But authorities said they properly prepared for the Eagles's 41-33 win against the New England Patriots, despite the chaotic celebrations. As the game was ending, one officer was heard saying on the police scanner: "It's endless, chief. Endless." People were reported brawling, flipping over cars, scaling the City Hall gates, mounting garbage trucks, and attempting to tear down traffic lights and lamp posts. Some fans jumped into crowds from a height, but not without injury, as one police officer reported, saying: "This is extremely horrible. We need rescue here, we got someone horribly injured from a fall." Unconfirmed reports of an explosion in the 9th district have been attributed to a power line, while others suggested that it may have been a firework set off in celebration. Looting and destruction was reported at multiple convenience shops, as well as at the department store chain Macy's. There were also unconfirmed reports of two police horses being stolen and recovered. Video was posted online of a man in an Eagles jersey kneeling on the ground and appearing to eat horse excrement, as appalled fans cheer him on. Meanwhile, the Philadelphia Zoo tweeted that despite rumours no ostrich rustlers had broken into the zoo last night. Police officers were also seen hugging, and celebrating in the streets. One woman filmed the Ritz Carlton Hotel's awning collapsing under the weight of dozens of revellers, some of whom were previously seen jumping off it. The incident was also reported by NBC's local TV station. There was also some backlash on social media, with many criticising some Eagles fans' inability to celebrate responsibly. If you’re part of these riots, you’re making your city and your team look incredibly bad. The team is expected to mark the historic win with a visit to the White House, but some players have indicated they do not plan on attending. 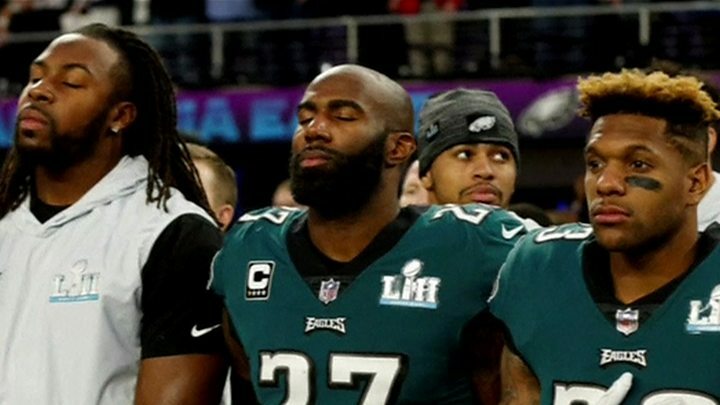 Safety Malcolm Jenkins told CNN on Monday he did not "anticipate attending that" while wide receiver Torrey Smith said last week he would skip the tradition if his team won. President Trump has previously criticised NFL players for kneeling in political protest during the US national anthem, which is played before American football games. He said players who fail to stand during the anthem should be fired or suspended. No players knelt or sat during the anthem on Sunday.